Cathedral of the Pines (Rindge, NH) is one place you tend to feel a little better about things. Its peaceful pathways and stunning panoramas make it easy to reflect on life and nature. It is literally a "cathedral without walls," where all people may worship and seek spiritual renewal. The Cathedral's scenic walkways and impressive chapels make for a memorable visit. Perhaps the most spectacular and best known views of Mt. Monadnock can be found here. 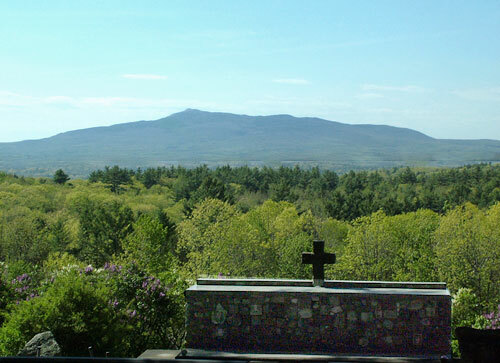 Monadnock serves as a backdrop for the Altar of the Nation (pictured above), an outdoor place of worship built in 1945. The Altar of the Nation was officially recognized by unanimous vote of the United States Congress as a national memorial to all American war dead. All of the stones that make up the Altar were donated. They come from every state in America, and from various battlefields around the world. The Altar also includes stone tributes from every U.S. president, beginning with Harry Truman. Cathedral of the Pines is open to "all who seek inspiration from the beauty of nature and the faith of a family who transformed their grief into an abiding testament to the brotherhood of men and women of every belief." It is an enduring monument to patriotic sacrifice. The Altar of the Nation and Women's Memorial Bell Tower are dedicated to the honor of American men and women, who have lost their lives in war. 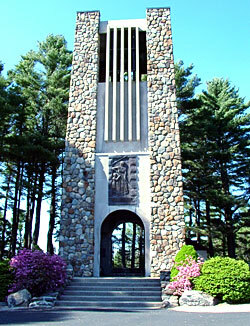 Originally selected by Lt. Sanderson Sloane and his wife, Peggy as the place to build their home when he returned from World War II, Cathedral of the Pines was created by his parents, Dr. Douglas and Sibyl Sloane, after learning that "Sandy" had lost his life when the bomber he flew was shot down over Germany in 1944. Other shrines throughout the Cathedral grounds include the bronze Tree of Life Fountain and Women's Memorial Bell Tower (pictured at right), a 55 ft memorial believed to be the first to pay tribute to the women of this nation. Unique stone appointments like the Mother's Chapel, also lend themselves to reflection and reverence. The Cathedral is open daily, May through October, from 9 am to 5 pm. A warm jacket is often necessary. Guided tours are available for groups (reservations required). There is a fee for group tours. Visitors may encounter other musical recitals, church choirs, and small instrumental ensembles. The Gift Shop features souvenirs, postcards and other memorabilia. Pets are not permitted on Cathedral of the Pines grounds. The pavilion is available, by reservation, for group picnics, bus tours and small family gatherings for a small fee. Bring your own lunch, or use the services of local caterers. Annett State Park, within one mile of the Cathedral is an excellent spot for picnics and other group outings. Nearby Mt. Monadnock is famous for its hiking trails and spectacular scenery. The Cathedral of the Pines is located off Routes 119 and 124 in Rindge, NH.